Today was ok. My cousins departed LLL. In the afternoon we went to see a puppy. It was so adorable. The dog was a Portuguese water dog. Its body was white but its eyes were black. Before they left I played cards. It was fun!!! But it was sad to see them go. But my mom and dad are coming Wednesday. So I am still excited. That’s all we did today that is worth going on the blog BYE!!! Finn received a complaint about his use of all those "O's" so he resolved to not use so many in the future. In all it was a sad day on the boat with all the crew leaving. They will be returning to 15 inches of snow with more on the way Sunday from a second storm. Now that's quite an awakening. Hoolie has been under the weather due to his habit of snatching whatever he finds along his walks and quickly gulping it down before we can react to raise his head to prevent. Last night he gave up what it took down, both ways - forwards and backwards, ugh! He seems to have recovered today so we're hopefully he's over it. Meanwhile I inspected some of the fishing boats nearby and saw one lady cleaning fish from their trip earlier in the day. The name of the charter is Afternoon Delight with a boat right in the marina. 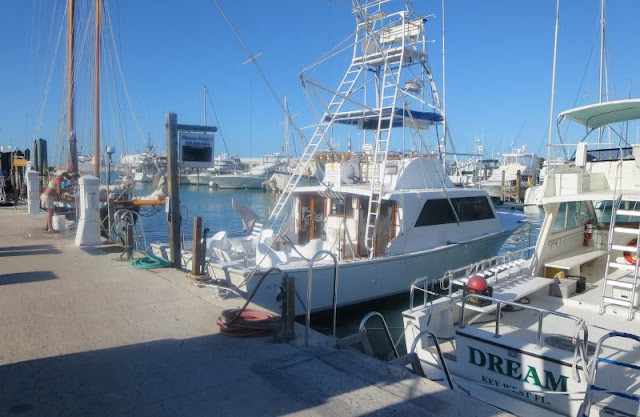 For those interested, the price for a full day charter is only $1399.00! If you want 1/2 day to save money then it's only $899.00. For that price you will be one of six people on the charter. You are expected to tip the captain and crew 20% above and beyond the price of the charter. It's obviously not a cost effective way to have fish for dinner, it's the adventure that counts, I guess. I don't fish so I've never partaken of the opportunity. Great blog post, Finn. It was both more enjoyable to read and more informative. Keep up the good work! !